Yaxley, Farcet, Holme and DAC strayed from their usual fen waters onto a small private lake not far from the city centre with rudd being the mainstay of most of the catches. Lionel Whaley caught from the start, fishing a waggler three rod-lengths out. Using red maggot and loose-feeding the same he caught 20lb 1oz. 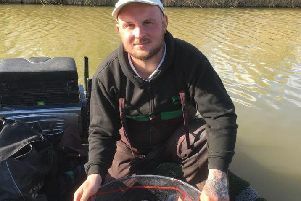 Pushing him hard off the next peg was John Furnell with 15lb using the same bait and tactics. Keith Rounding came third fishing close in, again using red maggot hookbait, and he put 13lb 6oz to the scales. Mike Mohan won the Tuesday Club match on the High Bank section at Ferry Meadows with a 15lb 15oz net of skimmers and roach caught on the pole. Runner-up was Alan Jopling with 13lb 15oz and third with 13lb 12oz was Mike Smith. Rob Wright has been smashing out big weights at carp waters across the area, but again he showed he is just as formidable on natural venues when he topped the Ramsey AS club match on their own waters at Ramsey St Mary’s with 8lb 6oz. Second was Harry Young on 5lb 15 oz. Martin Harwood again topped the open match at Haddon Lodge with 39lb 4oz using his tried and trusted method of fishing banded big hard pellet and feeding smaller samples to keep the carp coming. Not too far off the pace was Tony Moulds (34lb 10oz) and Brian Faulkner (21lb) was third. Tydd Gote, North Level Drain, Wednesday: 1 Jon Young 13lb; 2 Pete Emery 9lb 2oz; 3 Ray Malle 8lb 15oz. Tydd Gote, Black Dyke, Thursday: 1= Ian Benton and Colin Gibbon 7lb 8oz; 3 Andy Greenwood 6lb 15oz. Tydd Gote, North Level Drain, Sunday: 1 John Bates 11lb 14oz; 2 Ray Malle 10lb 14oz’ 3 Sonny Lynn 9lb 7oz; 4 Andy Greenwood 8lb 2oz. Float Fish Farm Fishery, Over 55s, Two Island: 1 John Final 97lb 1oz; 2 Tony Hudson 81lb 6oz. Float Fish Farm, Monday, Wagtail Pool: 1 Danny Carlton 173lb 5oz; 2 Alan Wiggins 168lb 15oz; 3 Nigel Baxter 143lb 3oz. Webbs AC, Float Fish Farm Fishery, Wagtail Pool, Sunday: 1 Gordon Harmer 104lb 3oz; 2 Peter Harrison 102lb; 3 Colin Clark 90lb 13oz; 4 Neil Bourne 88lb 14oz.